Bridges to Belmont recently partnered with a local non-profit, The Bridge Builder program, to host a networking/mentoring dinner for men from Tennessee State University (TSU) and Belmont. The “Men About Business: Mentoring and Networking Dinner,” was co-sponsored with Belmont University’s Bridges to Belmont Program and Office of Multicultural Learning & Experience. The event brought together young, diverse, collegiate men from Belmont’s Bridges to Belmont program and Tennessee State University’s Rho Psi chapter of Omega Psi Phi Fraternity, Inc. More than 20 young men were afforded the opportunity to meet and network with one another and engage with local professionals, entrepreneurs, educators and leaders from Nashville. 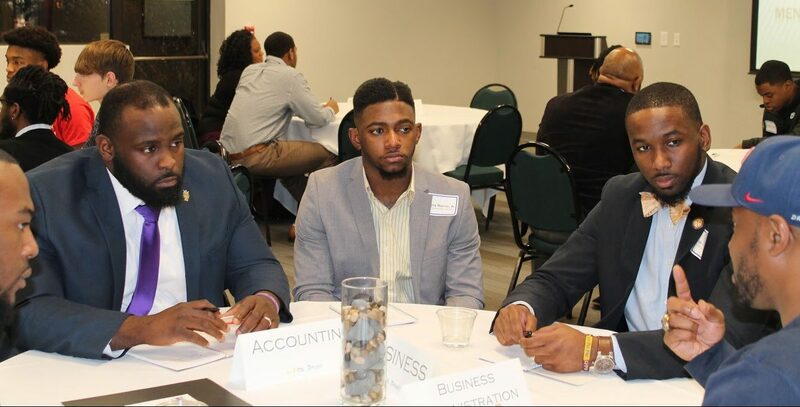 The event introduced these young men to professionals who work in their desired career fields and potentially connect them with shadowing opportunities, internships, practicums and eventually full-time employment. Additionally, all attendees were afforded to opportunity to hear Dr. Thurman Webb’s presentation on “Mentoring: A Model for Success.” Webb, assistant professor of psychology at TSU, has completed extensive research on mentoring and life coaching. Bridges to Belmont, the Office of Multicultural Learning and Experience and the Bridge Builder Program are committed to providing opportunities that will facilitate their transition from young collegiate men to young professional men. The Bridges to Belmont program was launched in 2013 as a full scholarship program designed to enroll high-potential students from Metro Nashville Public Schools who may not have previously been able to consider Belmont as an option. This program focuses on creating an environment that dedicated to academic achievement, community service and personal development to empower students’ personal passion to have an impact on the world through their education.